Mel bought this rocking horse when she was pregnant with her first child, so it holds a special place in all their hearts. The horse is hand carved from a solid piece of wood and although a lot of people comment that perhaps they should have brought a more traditional rocking horse to keep in the family, they love and treasure it. At the moment, Mel is a bit addictied to the new Heidi Swapp clear word stamps, so she incorporated the word Cherish into the title just so she could use the stamp! Mel has cut the Michael Miller Memories fabric paper into stars to use as accents for her layout. With this layout Rach wanted to capture the beauty of the home garden. She kept the layout simple as the photo is stunning, and by keeping the layout simple and clean, it makes the photo jump out even more. Rach has used the Michael Miller Memories fabric paper (which is the onsert from the For Keeps magazine) as an accent behind the main photo and for journaling strips. Just a little note that when using Michael Miller Memories fabric, if you are writing on it, use a ball point pen as a felt tip pen will bleed slightly into the fabric giving a furry look. 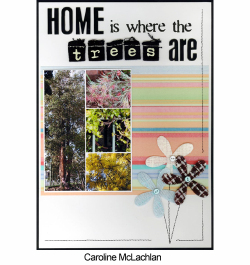 Caz is lucky to have a big block of land, so there is plently of room to have plants and trees around their house. With water and time restrictions Caz has found that natives are the best option. The ones that are lucky to survive 3 kids, a dog and 2 cats must be very hardy indeed. Michael Miller Memories Colorband Pastel fabric paper and multi tweed petals have been used as the main products on this layout. 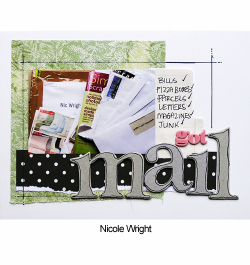 The title was created using Heidi Swapp Centre of Attention chipboard letters and Carolees Creations Love Worn black love letters. Machine stitching creates the flower stems and half a border. This weekend for the second time in six months, Marni and her husband are moving house. So for her last At Home layout she decided to create a layout about all the boxes that have become very much a part of their lives. At the moment Marni loves dots so she decided to use only the Michael Miller polka dot fabric paper for this layout. She used it to create two big brackets framing the left and right sides of her page and to create a double mat for her photo. Lately Marni has been doing most of her journalling through her title. 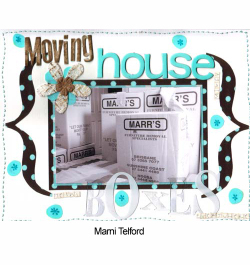 On this layout she "journalled" by using Heidi Swapp and Scenic Route chipboard letters, Heidi Swapp ghost letters and Carolee's Creations letter stickers. To add some interest to the page Marni also cut a flower and the little circles out of another piece of Michael Miller fabric. From bills, pizza boxs, parcels, letters, magazines to junk mail, at Nic's household the mail man is always dropping things off. So Nic decided to do a layout on the amount of mail, and all the different forms it comes in for the last week of the "At home" theme. 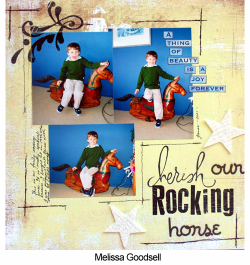 Nic has used the Michael Miller Memories fabric paper as you would patterned paper, and then layered the photo, journaling, more patterned paper, and title over the top of the fabric. Nic has used the BasicGrey mini monograms for the title, and outlined them to make them stand out a little more. She has also added a pen border around the photo, journaling and title to tie the layout together. 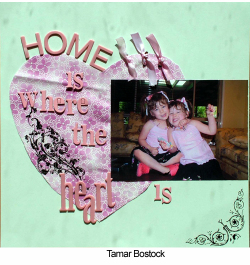 Tamar has always loved this saying - Home is where the heart is - so true - doesn't matter where you end up as long as you are with the ones you love. The half yard cuts of Michael Miller fabric are not stiffened - and are perfect for cutting out freehand shapes such as this heart. The nice thing about working with fabrics is you can do all that you usually do with paper - just with a different texture - including using rub-ons over the top. The basic grey rub-ons went on so smoothly and the self adhesive Heidi Swapp plastic and chipboard alphas stuck down easily without any extra glue!